When using a "ready to go" distribution almost never a text console will pop up. So why taking care about historic textural user interfaces? there is no way to understand the syntax without spending lots of time reading the manuals. If you have a crashed X desktop, try pressing Ctrl Alt F1 and you might get a chance that just X has crashed and you see a login prompt. Just login and try to kill the bad processes or do a shutdown -h now. There are actually different things, when you see text on your screen: bash, getty and console. The commando interpreter bash (bash is a shell implementation and therefore the link /bin/sh is a link pointing to /bin/bash) it runs in a console. So you use bash and might not be aware of it! The file /etc/passwd defines on a user base, what commando interpreter is used. You could have other commandos interpreters than bash, if you want to be a real Linux freak. The mingetty that even allows automatic login of a user (used for Home theater). Gettys are text based, but also graphical login X display manager as xdm, kdm, gdm and others do the same. In the file /etc/inittab it is defined what getty is used. In a graphical desktop environment as KDE there a numerous console programs where bash commandos can be entered. Finally all you type in and all you see, is connected to a teletypewriter (tty). What device file is involved can be seen by simply typing the command tty. As described above gettys are responsible for the login. See also the booting and runlevels section within this document. Type who to see who has logged in. Open console and check with tty what file you have. Oben other console and echo Hello > /dev/pts/0 Hello goes from one console to the other. When opening a console in a desktop environment a new /dev/pts/<n> file is created that is also reported when doing tty in that console. The pts dev files are pseudo terminal slaves that are linked to /dev/ptmx as man pts describes. # Z so they are the latest in the alphabet. # Create variables with common name and values. echo "Process PID $$ knows the global and local variables"
echo "Process PID $$ knows the global variables"
# hang here to observe that this process is alive. msgtext="Click ok to terminate PID $$"
kdialog puts a graphic window under kde and the scripts will not terminate until the button gets clicked. If you often have to type in path names, they are often not easy to remember. Type in the first characters of the path and press simply the Tab button and bash finishes the rest or it beeps when multiple choices exist. If it beeps press Tab Tab and you see all choices. Ctrl R followed behaves as Tab but it shows the available commands. PATH is a regular environmental variable, therefore different environmental variables exist. So the PATH variable of some daemon process might be completely different from the PATH variable that you see in the console. after this the PID (Process ID) gets printed. To put a running program in background Ctrl Z to suspend it, then type bg to put it in background. It will still in memory and can be put back to front using the command fg. However what was printed on the screen is lost. Without parameter fg brings back the last process put in background. To get an other process to the front use fg with a parameter. However not the PID is used as parameter, it is the job number instead. jobs shows the job number, the job numbers start from 1 within each started session. To see both job number and PID type jobs -l.
To stop (or abort, quit, exit) a running process do Ctrl C.
If it does not react, then it might be crashed, so try to suspend it via Ctrl Z and than use kill. There is also the dot command . <filename>. Dot is reading the file <filename> and executes the commands found in it. The file <filename> does not have executable permission. An other difference is that the script could do a cd to the caller shell. Deskop environments have GUI's to see what is going on, how the processes come and go. The | character represents an unnamed pipe. Wild cards let you select a group of files and directories. Using wild cards is a key feature in bash scripts and therefore it is absolutely necessary to understand how they behave. There are two dedicated characters for wild cards * and ?. The character * means any combination of characters. There is the exception that a dot . is not allowed in the first position, so it excludes hidden files and directories. Also the directory character / is excluded. The command ls * will give such a surprise. Not just the files are printed out but also the sub-directories with even their content, but just down to one level. The command ls . * is the next surprise the hidden files will be shown but also much more, even hidden files of the directory above. What is going on? What logic is behind? To be sarcastic, bash can not handle wildcards (directly). Before bash executes the command line, it replaces the wild cards in a previous step. The outcome of that first step can easily be understood when you type echo * or echo .*. This shows how bash resolves the wild cards. On this echo response, bash executes the ls command. So not just one argument (directory or file) is passed to ls, a list of directories and files are passed to the ls command. As an alternative type sh -x to enable some kind of debugging feature. After that, the next command will be printed with the replaced the wild cards, then it executes the command. This way you can observe the two steps. See how it handles the working directory . and the directory above .. , so you understand the strange directory up and down in the ls example. The characters . and .. are in the working directory and therefore handled as they would be regular files. Additionally bash lets you use any regular character as wild card by putting it into brackets [a]. The command echo [a]* prints out all files and directories starting with an a. Or echo [ab]* prints out all files and directories starting with an a or a b. Or echo [a-d]* can be used as a range. Or echo [!a]* to print all files and directories except the ones that start with an a. The command echo [^a]* is equivalent. Conclusion to list the hidden files (and unfortunately the hidden directories) in the working directory type ls .[!.]*. It is confusing isn't it? Strings are put between "<string>" characters. $ will be interpreted within the strings. To tell bash that those character have been taken as regular characters they have to be marked '<character>' or the \ character has to be put before. Watch out there is a difference between the ` the ' and the ' character. Parameter substitution is used to manipulate with strings. Takes the string inside the variable and looks for a variable that has this name, when found returns its contents. Watch out there is a difference between the ` the ' and the ' character. Therefore prefer the first syntax. Puts not the string pwd into the variable a but the name of the working directory. And now what it does. The command <command> is executed and produces a text that is interpreted in the command containing this term. <command1> does not use the <command2> as parameter. The $ character is used to execute <command2> first and then the result is(are) passed as parameter(s) to <command1>. The first line must have some magic characters to tell what interpreter has to be taken to run the script. It is the path to bash. Gentoo makes heavily use of the runscript instead of bash for the files in /etc/init.d. The # character will be interpreted from bash as comment line. Make use of a syntax sensitive editor when you write bash scripts. And finally the file has to be found. Either call it with the full path /<path to script>/<mybashscript>, as ./<mybashscript> or copy it where echo $PATH points. Even better, keep it where it is, add a version number to the filename and create a symbolic link not having the version number from a directory that is in the path . Ore even better use a system monitor of your desktop environment. And if you open an other window you will start a new bash process with an other PID. The PID's are unique and can also be used in file names to create unique files: ls > tmp.$$ to avoid conflicts from accidentally accesses by two processes running the same bash script. Since exported bash variables are environmental variables and get read by the operating systems and various programs not written in bash (as C and Python) it is fundamental to understand how they behave. Read stores all keys into the variable a and returns when CR is typed. prints the content of a. The $ sign is important to identify that it is a variable and not just the letter a. Now type bash, this creates a child shell (that can well be observed in the process table). Then type echo $var and nothing will be printed, since the child runs on an other process and var did not got inherited (exported). Type exit to quit the child shell and you are back in the original shell. Type echo $var and hello pops up again. Finally delete the variable by typing unset var. Now type echo $var again, to verify that it has been deleted. The previous created variables are just available by the current running process and are therefore be called local variable. or set to get all including the local variable. Exporting means the child process gets a copy of the variable. If this variable gets overwritten or deleted, just the copy gets modified and not the variable of the parent process. Obviously but very confusing is when a local gets gets created with the same name as a non exported variable or if a exported variable gets over written. Then multiple variables with different values appear on the computer. If a bash script wants to receive and be able to modify the variables from the calling shell, then it has to be called adding . in front of it (.<name of script>). In this case no new PID is created. The script has the same PID as the calling process. To understand Linux, it is very fundamental and very important to understand what happens if you call a script, this is the same as calling any other executable. exec <command> starts the bash command within the same environment and PID as the calling process. The calling process is therefore terminated. Change the directory to where your test script is and type: exec ./testscript. Notice that the PID stays and just the global variable is there. When clicking to the close button the console closes. source <command> or its short form . <command> starts the bash command within the same environment and PID as the calling process. Environmental variables are exported bash variables that a process can read, but they are usually not created by the running applications, they are part of the system environment. Even tough they are usually created using bash they can be read, written and created by other programming languages as C, python and what ever. However there are also bash variables accessible different processes and used to control the system as the localization variables or more generally speaking the environmental variables. Finally /etc/profile is a script called when bash starts. /etc/profile reads /etc/profile.env and puts the variable in RAM of the current process. To prevent that a new process with a new environment is created /etc/profile is started with the source key word source /etc/profile or its short form . /etc/profile . Without the keyword source or . the new created process would get the updated environmental variable but everything would be lost when /etc/profile terminates. There is also a hierarchy among the processes that can be viewed when for example pstree is typed in. Some selected variables (declare -x or export) are inherited down wards the tree, therefore not all processes will see that an new /etc/profile.env is created. Additionally env-update uses ldconf to create files as /etc/ld.so.conf for the dynamic linker run time bindings. env-update is a python script: /usr/lib/portage/bin/env-update env-update can be called manually and is also called when emerge executes. The script ~/.bashrc is called when a shell is opened and therefore setting environmental variables can be initialized or changed there. Using the program [ in bash scripts looks as it would be a part of the bash syntax (especially for the if else conditional branches and loops), but this is not the case, it is a standalone program and can be used in all kinds of situations. Bash syntax can be so easy, but also so confusing. There are different options that might help. However there are different methods to know what will go on during a script runs. Type s to go step by step through your script. Be aware, when you have enabled bashdb, then some other bash script (as used in emerge) that were previously running without interruptions, might be stopped and showing the bashdb prompt. Just type s until they restart. There's a bashlogger useflag to log all history commands. It should ONLY be used in restricted environments to learn what is going on (or on honeypots to log attacks). Default settings are in /etc/inputrc that will be overwritten by ~/.inputrc when present. See man readline to understand the contents of those two files. The Linux login gets the default shell passed, in case of bash, the bash configuration scripts are started at login. Users have ~/.bashrc where command can be added that are started when a shell opens. ~/.bash_history remembers all commands typed in (up/down arrow make use of it) ~/.bash_logout is run when a shell closes and ~/.bash_profile is sourced by bash for login shells. 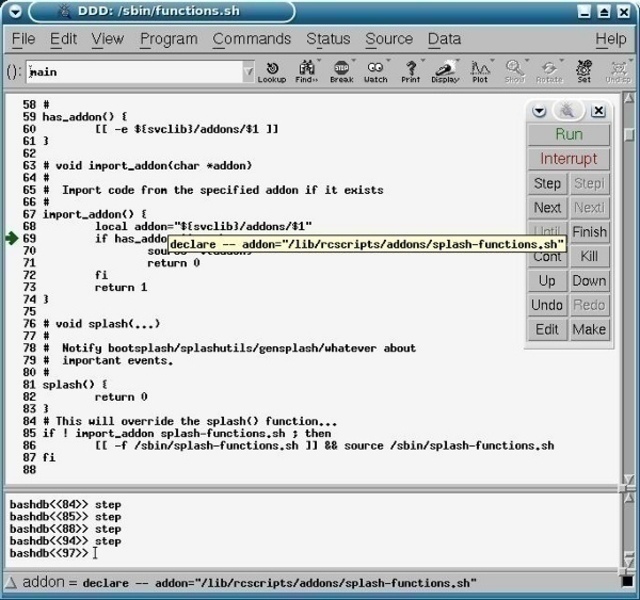 To use a Windows computer to communicate with a Linux computer using Telnet or SSH a program as putty.exe from http://www.chiark.greenend.org.uk/~sgtatham/putty/ is required. Telnet is simple but not considered to be safe enough, so usually SSH (Secure Shell) is used to log into the Linux computer and having a working console. Copy files between the windows computer and the Linux computer needs something on the windows computer. The easiest way is using a program as winscp down-loadable at http://winscp.net/ and use SCP (Secure Copy) for that. Winscp resolves many more issues, since it is a file manager and allows deleting, creating, editing files and synchronizing directories between the two computers. The two programs putty.exe and WinSCP.exe run directly without the hassle of installing them under windows. So no administrator rights are required on the Windows PC.